Difficulty level: He has it listed as low intermediate and I would agree. This is the second model that I attempted after a very long break. My then future wife got me in to origami years ago. My marriage proposal to her was 1000 paper cranes. Back then instructions were all in books and I soon got frustrated with the more complex models. Through a series of recent conversations I became aware of all the videos on YouTube. It has reopened this world to me and I have been having fun with it. 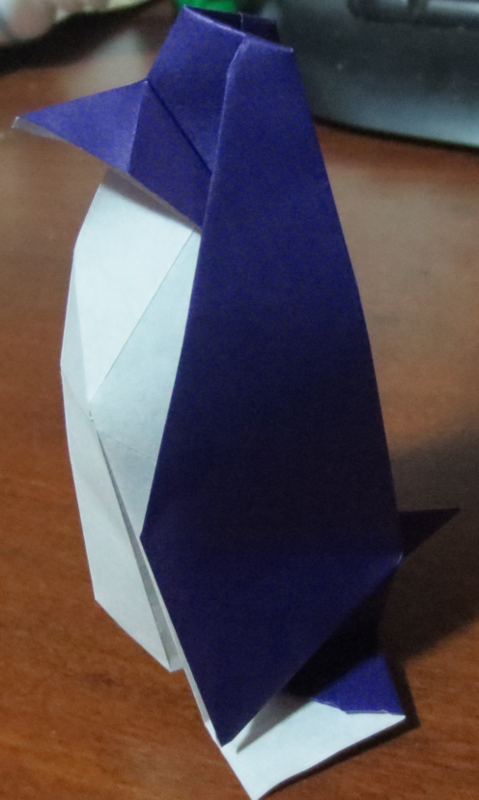 I chose the penguin because there is a connection between my wife’s work and penguins so it would be fitting for her to take to work. I also, on viewing the whole video, though it was one that I could do. There was one step that I had trouble with. With books I would have given up but with YouTube I just kept replaying it until I figured out what his fingers were doing and what the end result was going to look like. I wanted to rank these some how and that started me think about what I was getting out of this. I want to happy with the end result of the model. I am using it as a way to relax so calm at the end is a goal. I also want to feel intellectually challenged, work my brain a little. Happy: 8/10 I could do better on the tail if I made another one. Relaxed: 9/10 Only one step frustrated me. Intellectual: 9/10 It was good to think through these again and I figured out the frustrating step.